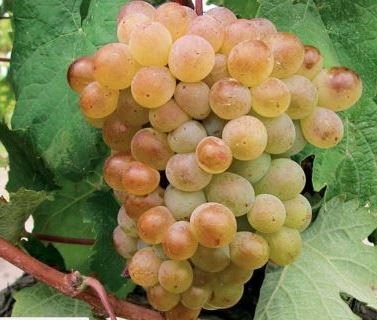 Picardan is clearly the most obscure white wine grape allowed and used in Chateauneuf du Pape. Today, less than 1.65 hectares are planted to the varietal. Picardan is an interesting grape because it really does not add much to a blended wine, other than perhaps some additional body or possible acidity and light floral notes, or musky notes, which is why you see so little of the varietal these days. Picardan, with its large leaves produces tightly packed grape clusters with small, pink, bronzed, tinted berries is also planted to a minor extent in the Languedoc appellation. During the 1600’s and 1700’s the use of Picardan was it its peak. Over time, the grape has continued to fall out of favor. Currently, it is possible that there could be less than 2 hectares of vines planted in the Chateauneuf du Pape appellation today. If that is true, in time, the grape could one day be extinct in the Southern Rhone Valley. To give you an idea on the continuing loss pf Picardan planted in Chateauneuf, in 1989, the grape occupied .10 of all plantings. By 2004, it was down to .05 and by 2014, only .01 of the vineyards had any Picardan vines in Chateauneuf du Pape. Chateau de Vaudieu produced a very small amount of a wine made from 100% Picardan that comes from a sliver over 1 hectare of vines. It’s as you can imagine, quite difficult to find as the total production is just over 2 barrels of wine. Tablas Creek located in the Central Coast appellation of California planted 1,000 vines of the grape in their vineyards in June 2013. They are the only producer outside of the Southern Rhone with a vineyard planted to all the allowable grapes for making wine Chateauneuf du Pape. Picardan due to its neutral flavor character would make a decent wine and food pairing with very light dishes, perhaps with some citrus flavors in the preperation.